Is debt taking over your life? Along with the financial worries, struggling with debt often leads to depression, anxiety and stress and can cause tension or arguments between you and your loved ones. Here, we look at how you can begin to cope with debt, and how you can deal with the emotional and mental troubles that it brings. Before you can tackle your debt and the associated worry and stress, you need to accept that it’s a problem. For many people, debt is something that creeps up on them, building slowly over time. Your debt may have grown from being small and manageable into something that now feels like it’s totally out of your control, but now you need to accept that your debt is a problem. Once you have accepted that your debt is a problem, it’s important that you talk to someone about your worries. By talking about your problem you share the burden of worry and help to reduce feelings of stress. Be open with your partner about your debt, it affects them too – both financially and emotionally. If you feel comfortable, talk to trusted friends or family about your debt, but don’t worry if you feel like you can’t – it can be a difficult subject to bring up. The most important thing is to ensure you get professional debt advice from a debt counsellor who will hear you out and help you to deal with your situation. Get in touch with a debt organisation like the Citizen’s Advice Bureau or Consumer Credit Counselling Service for free impartial advice. Stop ignoring bills and start speaking to your creditors. Taking action also has the benefit of giving you a feeling of achievement, and you’ll soon start to see that your debt is a problem that you can overcome. So if you’re feeling as though your debt is a huge problem, or something you can’t deal with, remember that taking small steps will help to restore your confidence. 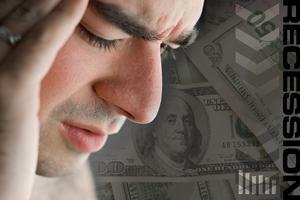 Are you dealing with debt worries and anxiety? AS WE continue to go through turbulent economic times, a lot of people are in a state of panic and anxiety. Thousands of families are overwhelmed with the difficult choices and situations that they face. The questions that I am often asked are: “Will my family’s increasing debt load result in bankruptcy?” “What happens if I lose my home in foreclosure?” Most people are living paycheck to paycheck with zero savings and they barely have enough to put food on the table and keep the lights on. Personal debt from mortgages, credit cards and other loans has surged and a lot of people have borrowed more than they can pay back. Are you one of these people? Maybe you have been using your credit cards just to survive, hoping that things will turn around soon. But even credit card companies these days are no longer lending money as they used to. They are reducing credit lines and closing inactive accounts to reduce their risks. A few years ago, people used to be able to refinance their mortgage and cash out their home equity every time they needed the extra cash to keep them afloat. But those days are gone and we probably won’t see them again for a long while. The average household now owes approximately $25,800 in credit cards. Studies show that 65% of all credit card accounts are only paid the minimum required every month. And of course, you know what that means. As long as you are only paying the minimum required on your credit cards, you are guaranteed to remain in debt for a very long time- perhaps for the rest of your life. So how do you protect yourself and your family in the midst of this financial turmoil? If you are in debt, perhaps you’re feeling as though you have no hope for the future until you find a way to get out of debt and start saving again. Personally, I’ve seen even close friends and relatives go through the agony of losing their homes in foreclosure so I know how you feel. Some people are so paralyzed with fear that they end up doing nothing to change their situation. One thing you can do is to find a way to reduce or eliminate your debts so that you can have more money available for basic necessities. Experts predict that it may take a while for the economy to get better so this is certainly not a good time to be in debt. Continuing to borrow when you’re already overextended will only lead to financial disaster; it’s only a matter of time before you face the inevitable consequences. Avoid buying anything on credit unless it’s an absolute necessity. If you are struggling with debt problems and need to find a way out, we can help you determine your best course of action. If you’ve done everything you can but nothing has worked up to this point, maybe you need to accept the fact that you can no longer do it on your own and that you need professional help to get you out of your situation. The worst thing that you can do at this time is to procrastinate and do nothing until your situation becomes a financial emergency. For a free consultation, call Toll-Free 1(866) 477-7772. We have offices in Glendale, Cerritos, West Covina and Valencia. Unemployment, Debt and Anxiety on the Rise – A Perfect Time to Thrive! The economy is busted. The American Dream is dead. Once built on the pursuit of happiness, now our country crumbles because of it. A dismal state of existence -- a perfect time to thrive! Though most of us will do anything to avoid challenge, discomfort or even the slightest bit of inconvenience (hence, the Clapper, remote controls and Velcro), research suggests that people who endure hardship often experience positive growth as a result of such. These people are thrivers - and they emerge from adversity with a new lease on life and a greater sense of vitality. Thrivers also know how to embrace challenge and discomfort, spinning them into opportunities for personal growth! While we may still cringe when recalling this tragic event, even amidst the horror of September 11th psychologists found evidence of post-traumatic growth (positive changes after a traumatic event) - where individuals experienced a deeper appreciation of life, a shift in life priorities, and enhanced spirituality, relationships and self-sufficiency. Similar studies on trauma have also found favorable changes in behavior, worldviews and relationships stemming from hardship - highlighting our human potential for positive adjustment and adaptation to stress. In fact, challenging times can enhance coping skills and amplify personal strengths and inner resources essential for resilience and mastery of challenge and change - a hallmark of thriving! But who are these fascinating people (thrivers), and what do they have that the rest of us Velcro-wearing, clap-happy ninnies don't? The second I met Chelsea and Maya George on a train from Salzburg to Prague, I knew there was something special about the mother-and-daughter pair. At 6 years old, Maya had already explored much more of the world than I had in my entire lifetime, and it was Chelsea's zest for travel that enabled her to endow Maya with such amazing experiences. Though our time together was short, I could tell that Chelsea's life story was fascinating - emitting an air of resilience, verve and excitement! Before parting ways in Prague, Chelsea and I exchanged emails, enthusiastic about keeping our new-found friendship budding. Every holiday or end-of-summer season thereafter, I would receive beautifully-written emails or cards crafted of stunning photography, illuminating Chelsea and Maya's exotic adventures. But I'll never forget the day I received a different kind of email from Chelsea -- the one that told me that Maya, then 9, had been diagnosed with an inoperable brain tumor. Though she had been vivacious, curious and alert from the time she was born, less than one month later Maya passed away. Most of us will never know what it's like to lose a child. Instead of spiraling into a womb of depression, Chelsea was able to thrive through this hardship and celebrate Maya's life despite the deep loss she experienced. In fact, Chelsea proudly confesses, "Maya did more in 9.5 years than most people could do in 90". Today, Chelsea continues to travel the world and is married to Andre, the love of her life. When Chelsea's not traveling, she earns her living teaching racquetball at University of California Santa Cruz (UCSC) and survives mostly from the revenue of the rental properties she began investing in when she was a student at UCSC. Chelsea prefers the use of public transportation or a bike to driving, and she has a predilection for being frugal, splurging only on travel and photography. Though Chelsea is an extraordinary woman, like you and I, she shops for groceries, pays the bills, and even clips coupons. Yet, Chelsea has something that many of us don't have, something that enabled her to grow through Maya's death, that has compelled her to keep traveling and that keeps her from falling prey to a humdrum routine - a Thriving Mindset! Click Here to find out more about the Thriving Mindset - what it is, why you need it and how to get it!